The CRA Turbine Meter is engineered for use in high pressure systems with a wide range of applications in both corrosive and non-corrosive liquids. Popular industry use inlcudes waterflood secondary recovery, fuel metering systems, LPG, chemicals, petroleum products and crude oil production. 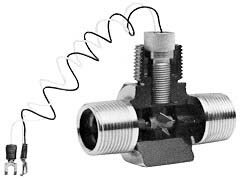 These meters are available with either male NPT or ANSI flanged connections and are available in two linear accuracy grades. Daniel Industries, P.O. Box 19097, Houston, TX 77224. Tel: 713-467-6000; Fax: 713-827-4360.